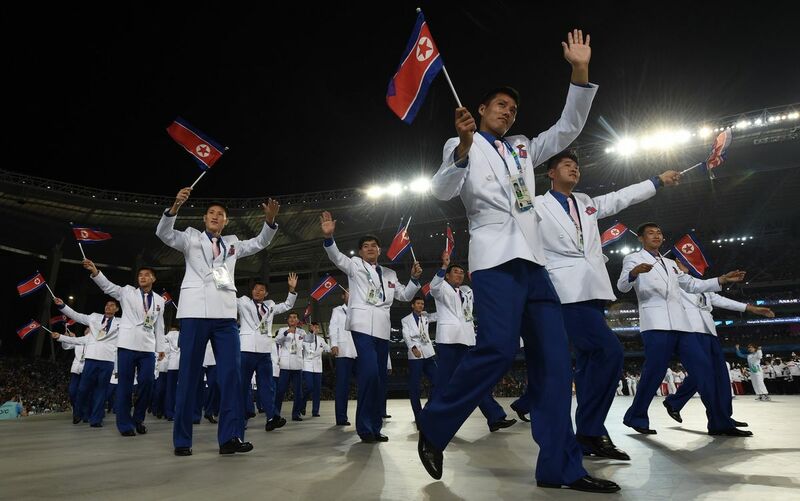 North Korean team players are seen singing their national anthem at Incheon Football Stadium September 15, 2014. 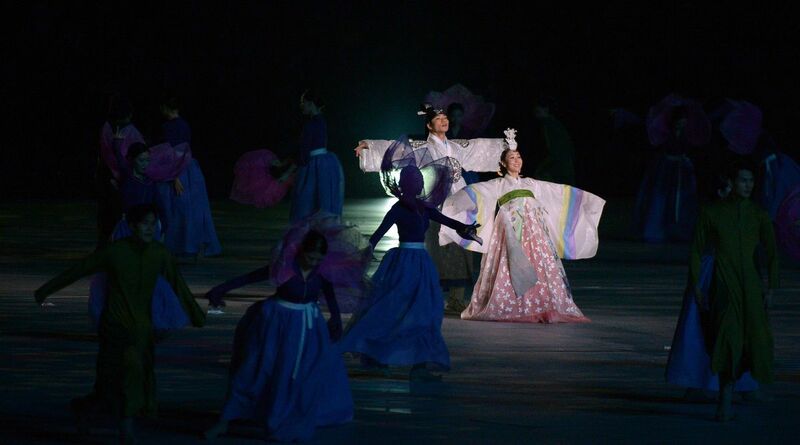 INCHEON, South Korea - North Korea coach Yun Jong-Su attacked refereeing bias at the Asian Games football and warned that Thursday's gold medal showdown with South Korea must be "fairly" handled. 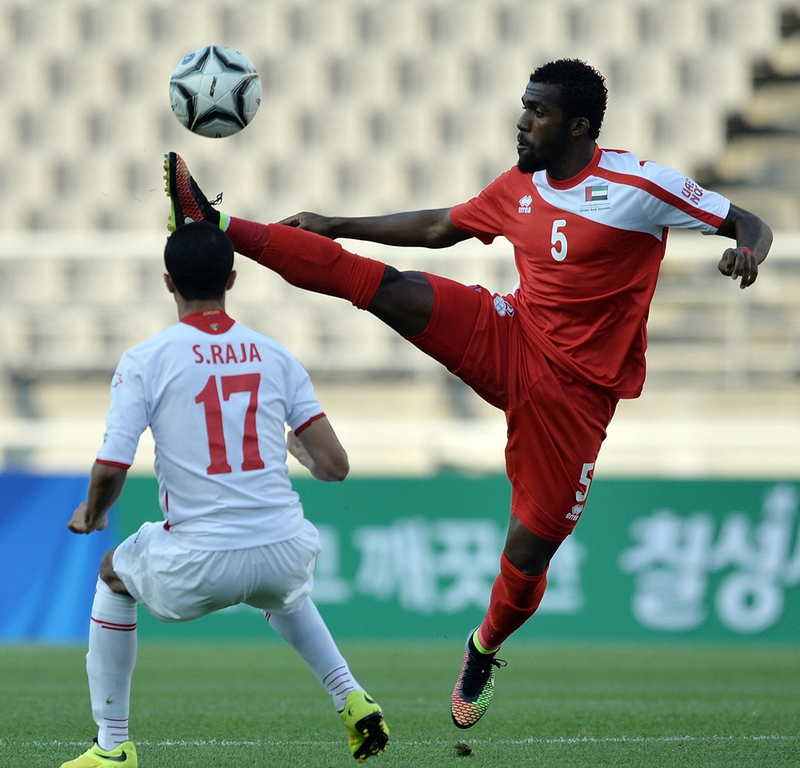 Yun protested at decisions made during the Stalinist state's semi-final win over Iraq. 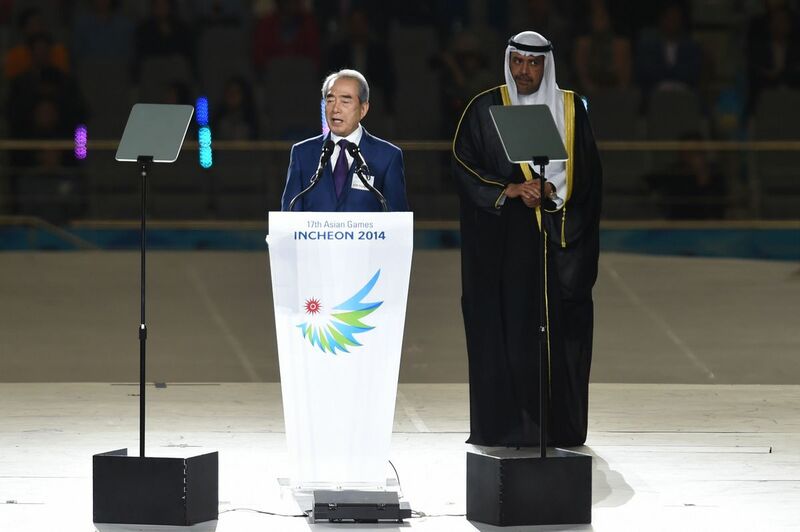 "We hope the final is refereed fairly. 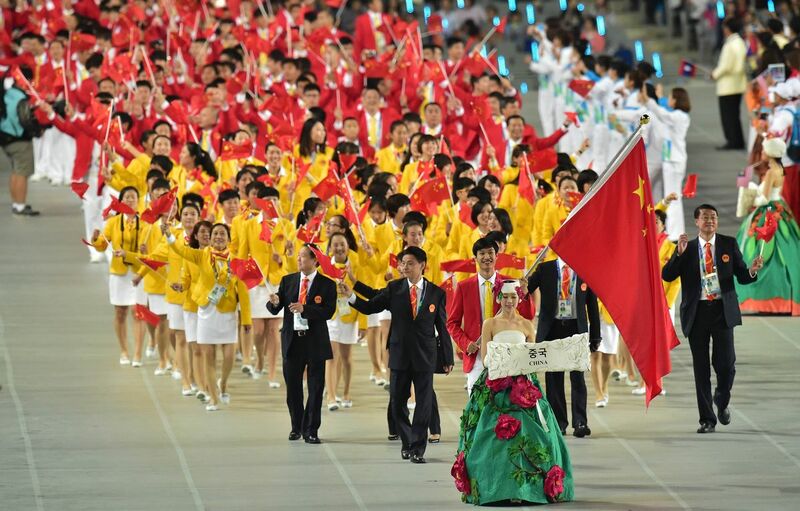 If so, we will fight fairly and squarely," he said. 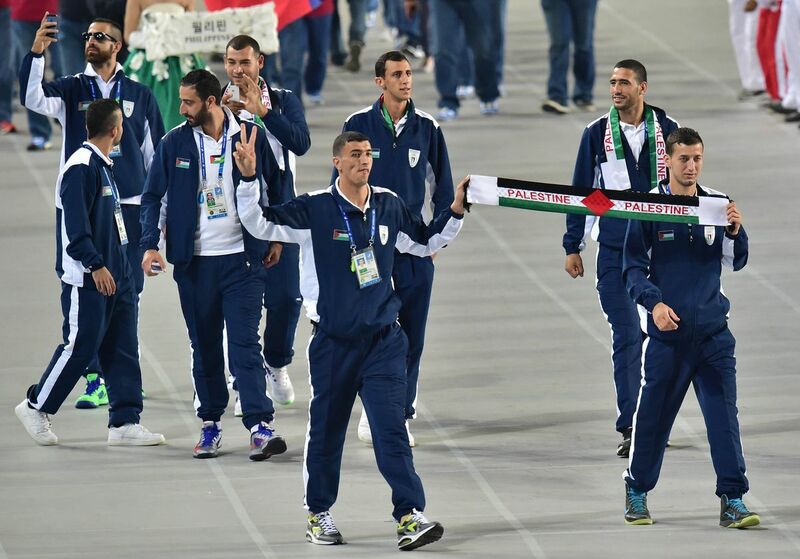 "Did you people see the match against Iraq yesterday?" 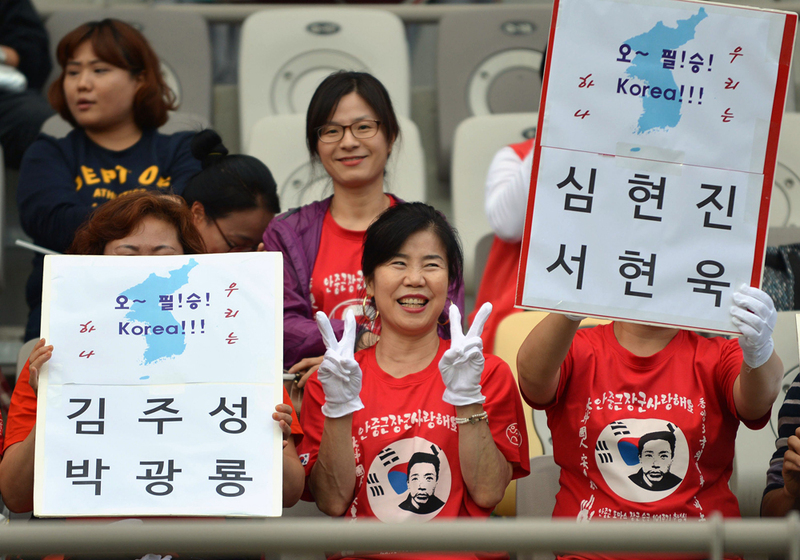 he fumed at a news conference, still upset at the red card shown to star striker Jong Il-Gwan moments after scoring his side's winner against Iraq, his fifth goal of the tournament. 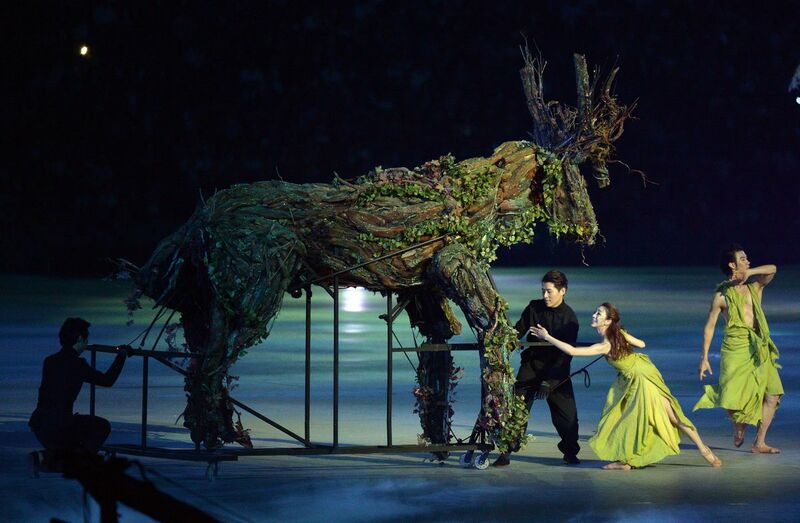 "What did you make of it?" 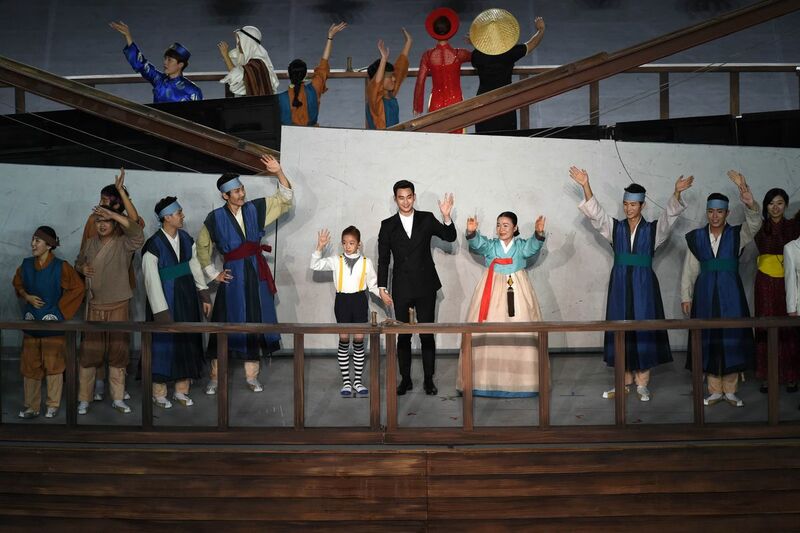 he added rhetorically, before continuing his rant. 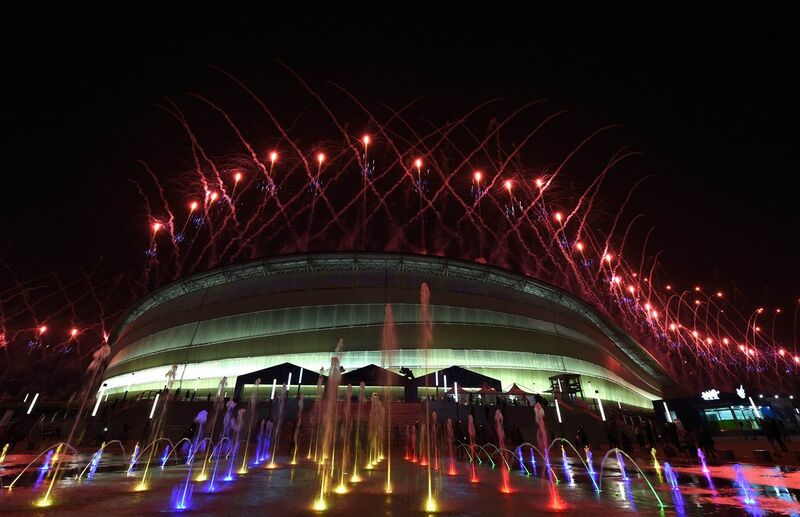 "Correct calls are an essential part of fair play, but things are not like that here." 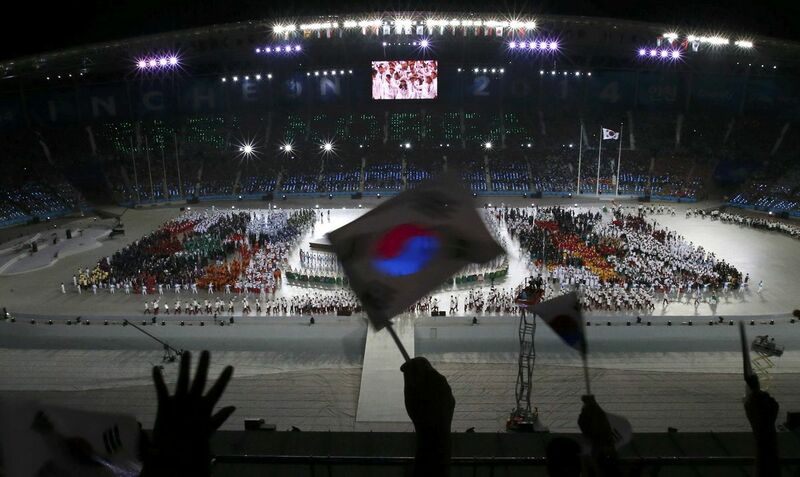 Yun's preemptive strike before a potentially explosive clash in Incheon were apparently designed to ensure South Korea do not receive any extra help from the officials in a game which will be played just 120 miles (195km) from the border. 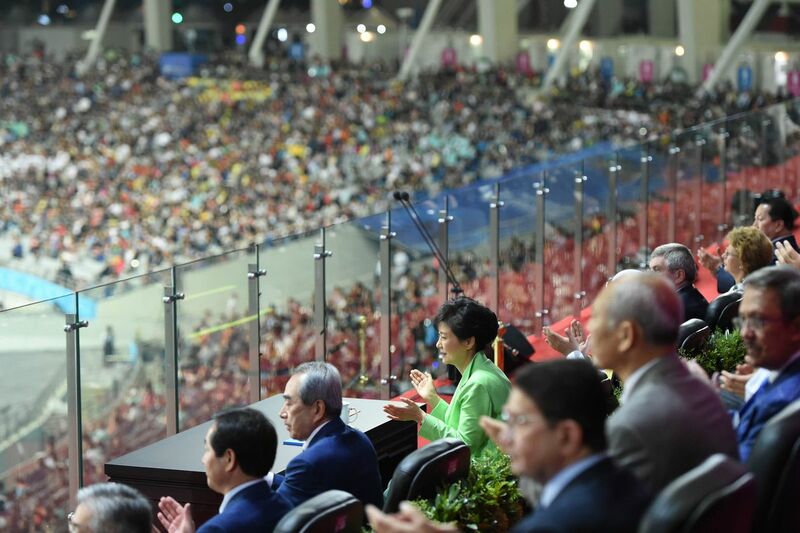 "There were a lot of bad calls in the match yesterday," he growled, referring to his side's hard-fought victory over Iraq, which also saw defender Kang Kuk-Chol stretchered off in the first minute. 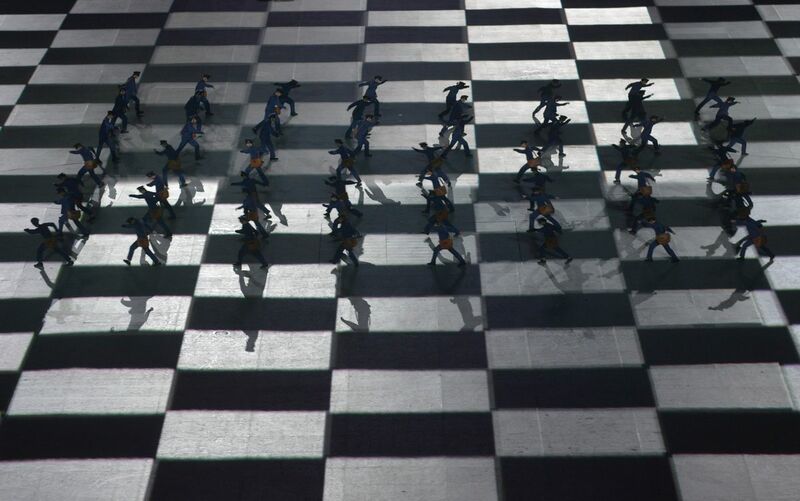 "Perhaps the referees can't see things from a distance, but he failed to see things happened when he was close to the play. 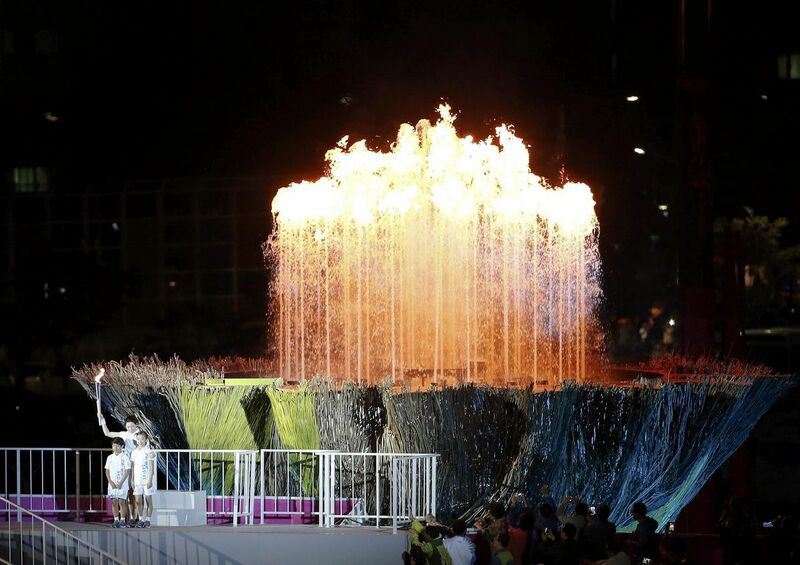 We hope the final is refereed fairly. 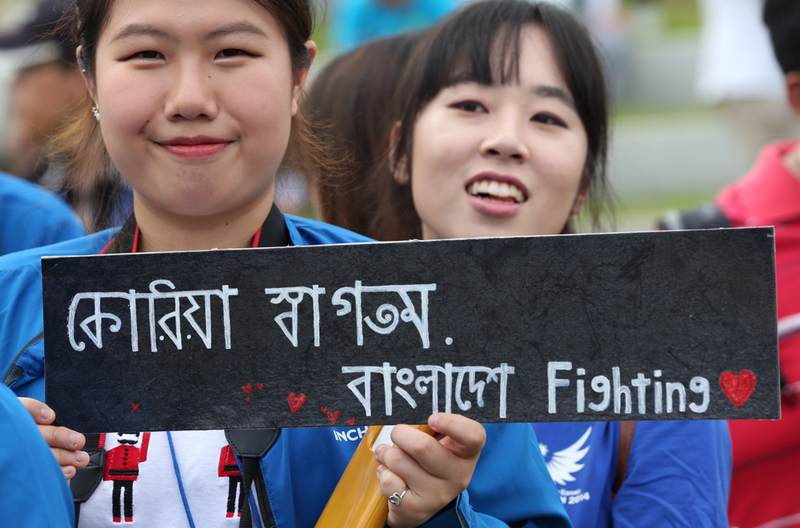 If so, we will fight fairly and squarely." 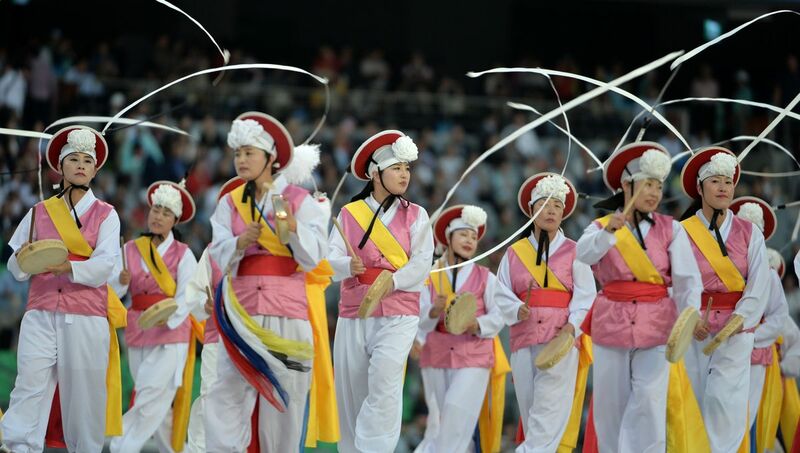 Thursday's clash between the rival Koreas will be one of the highlights of the Games, particularly as the South is hosting the event and is desperate for sporting success. 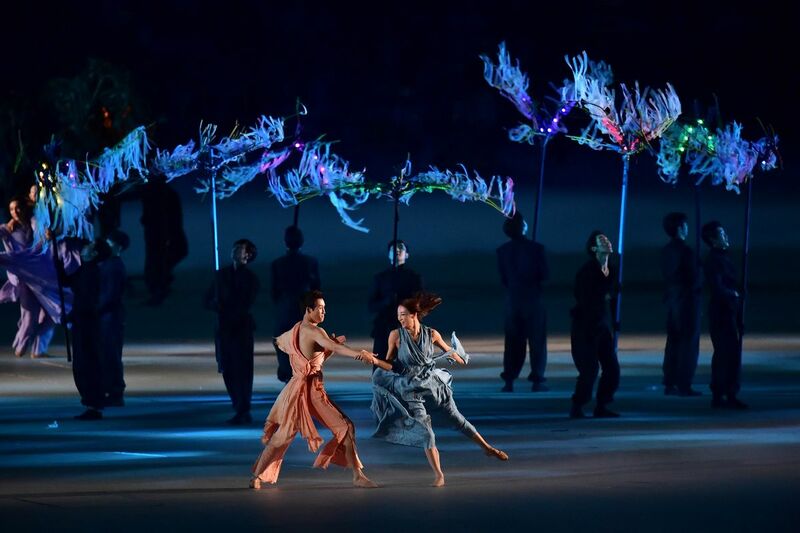 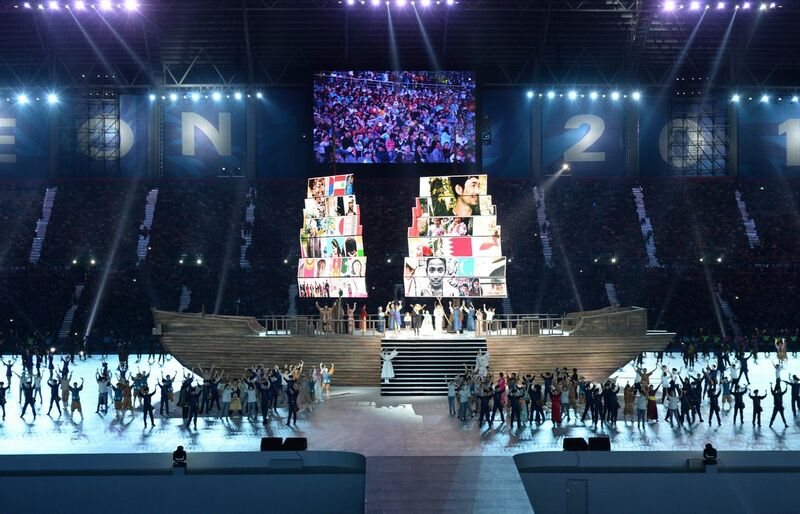 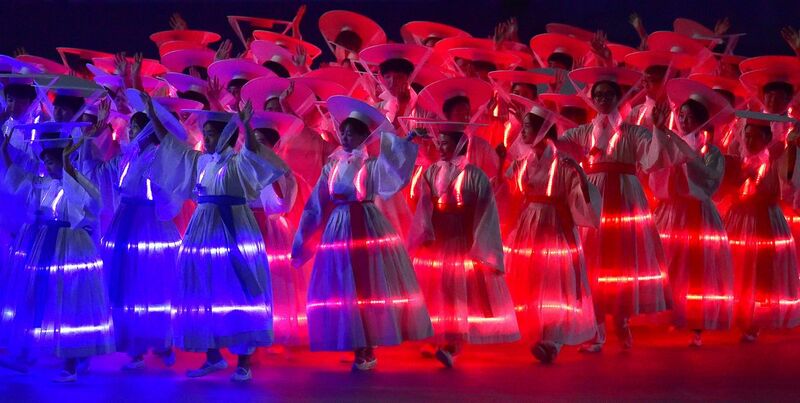 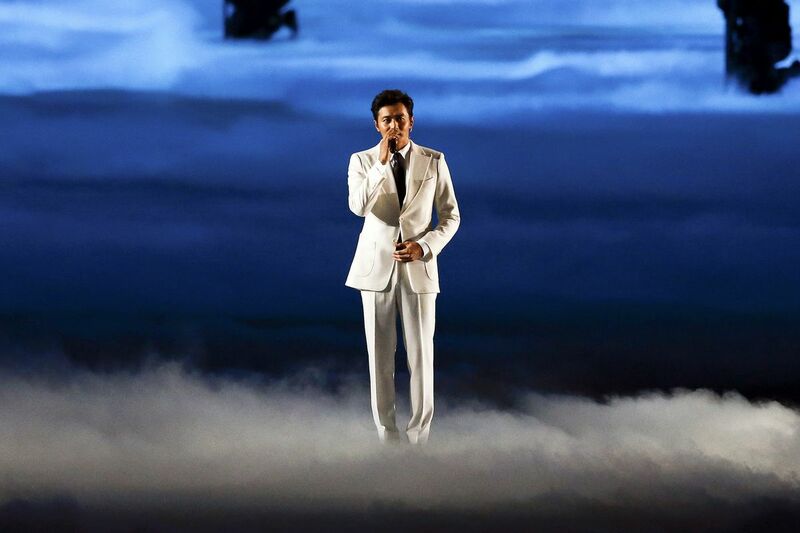 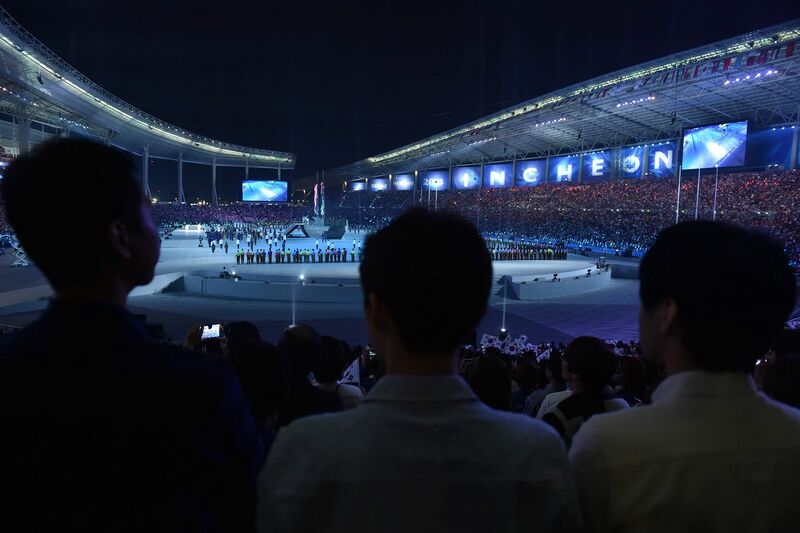 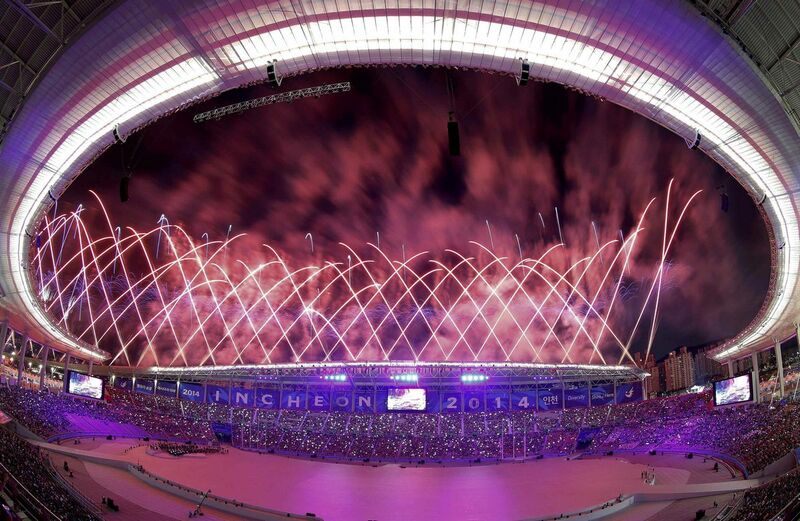 South Korean President Park Geun-Hye opened the Incheon Asian Games at a glittering, K-Pop inspired ceremony Friday as North Korean athletes received an unexpectedly warm welcome. 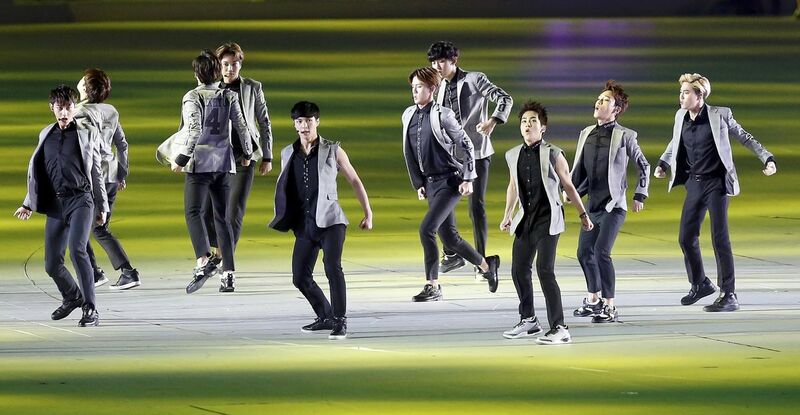 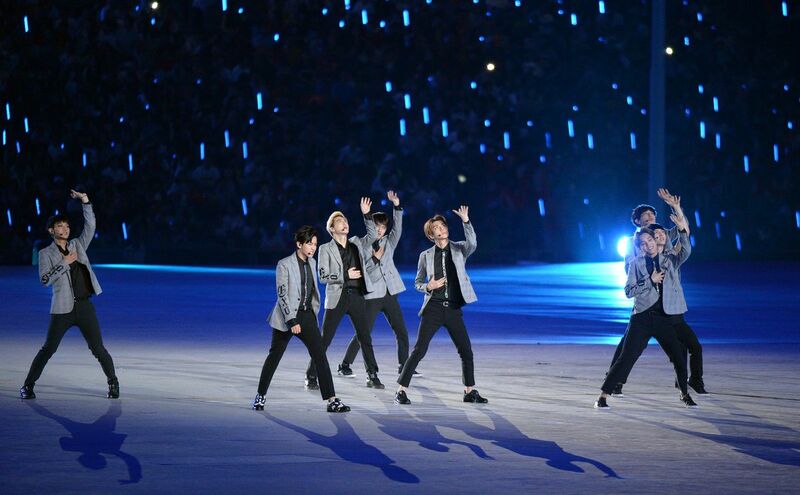 The show to mark the start of one of the world's biggest sporting events, themed around the concept of "One Asia" united as a family, had begun with a blast of high-octane K-Pop from boy band Exo. 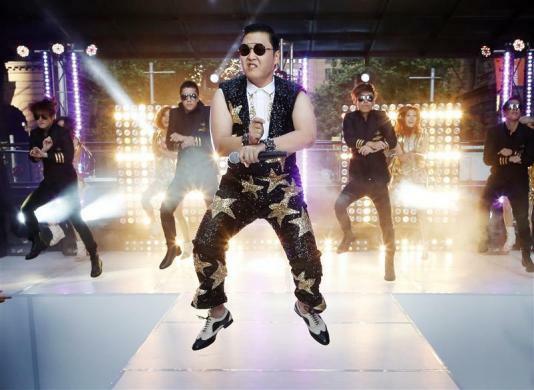 "Gangnam Style" singer Psy was set to close the spectacle, heralding the start of 15 days of competition with 9,500 athletes. 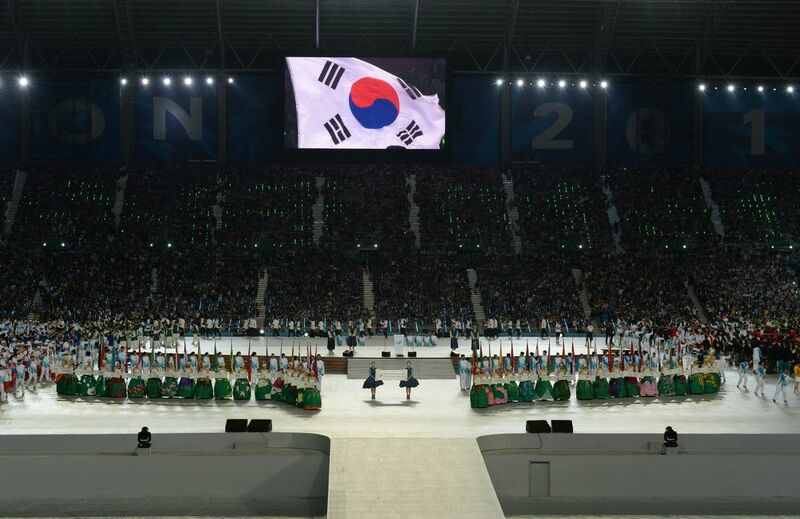 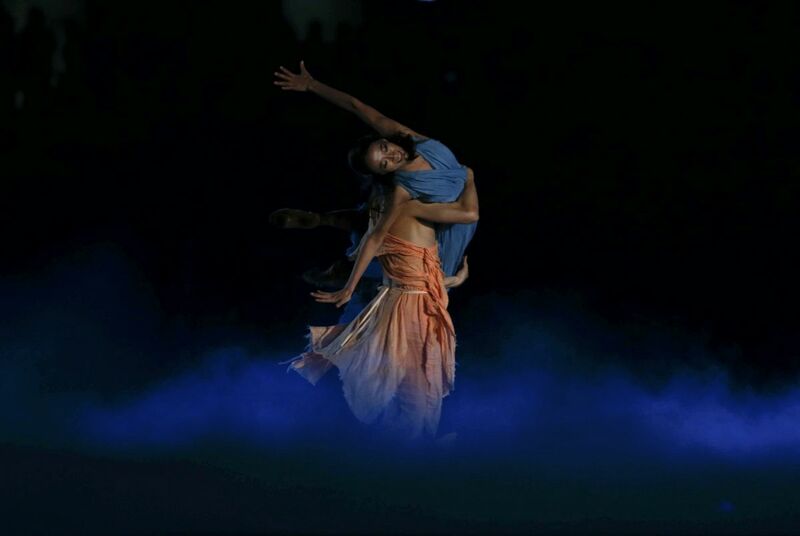 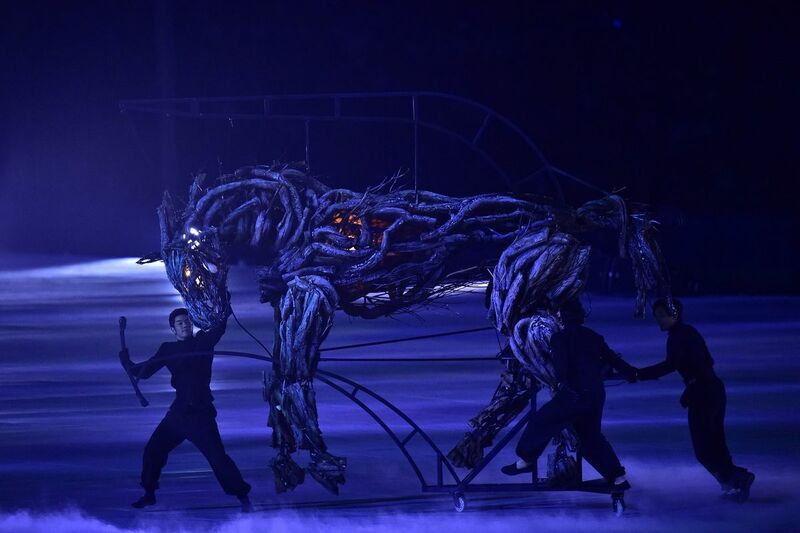 Organisers were hoping the ceremony can create a much-needed buzz around the Games after slow ticket sales, just 18 per cent early this week, generated an air of apathy. 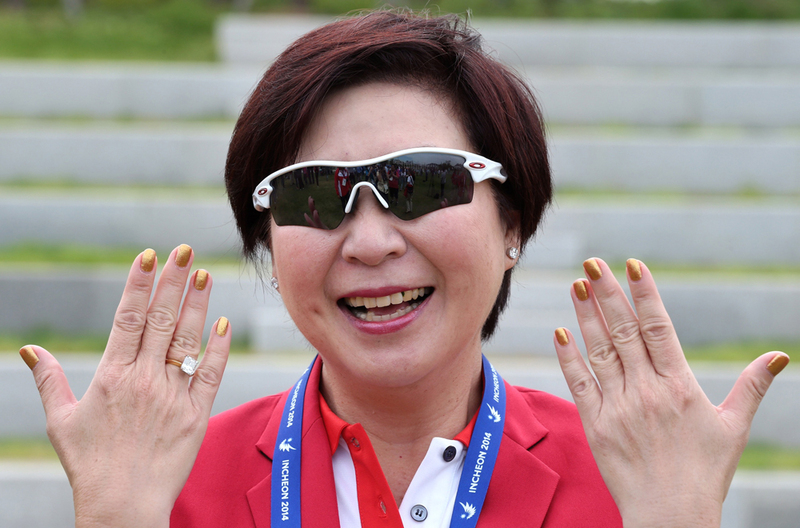 ingapore's chef de mission for the 17th Asian Games Incheon 2014 Jessie Phua. 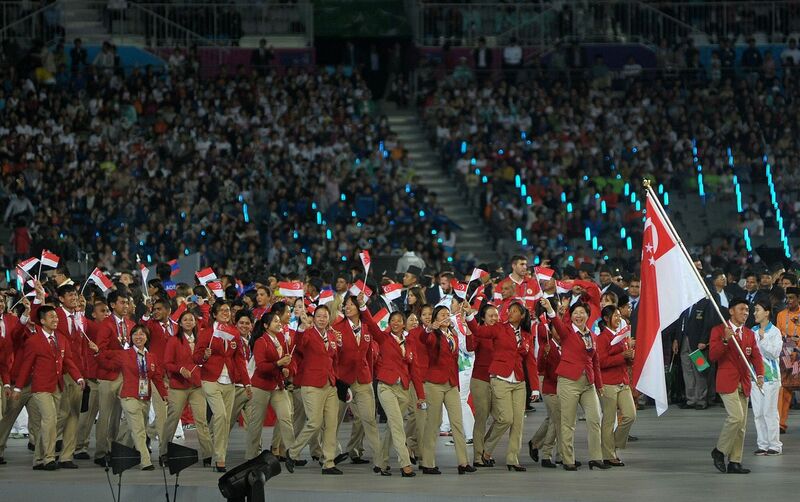 Singapore's chef de mission Jessie Phua leads the delegation at the team welcome ceremony. 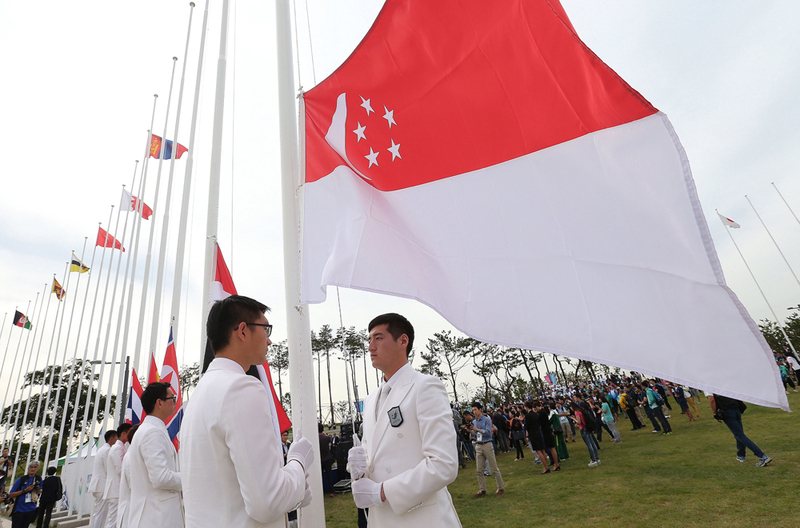 Singapore delegation at the team welcome ceremony where Singapore's flag was raised at the Athletes' Village on Sep 18, 2014. 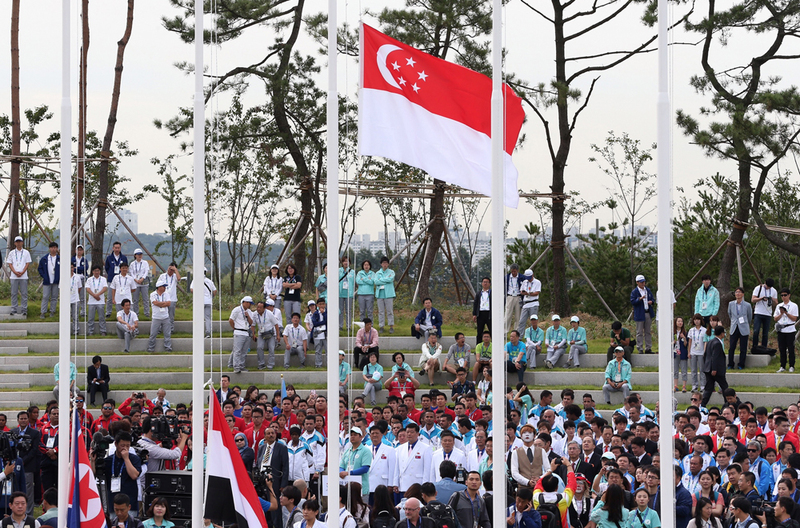 The Singapore's flag was raised at the Athletes' Village on Sep 18, 2014. 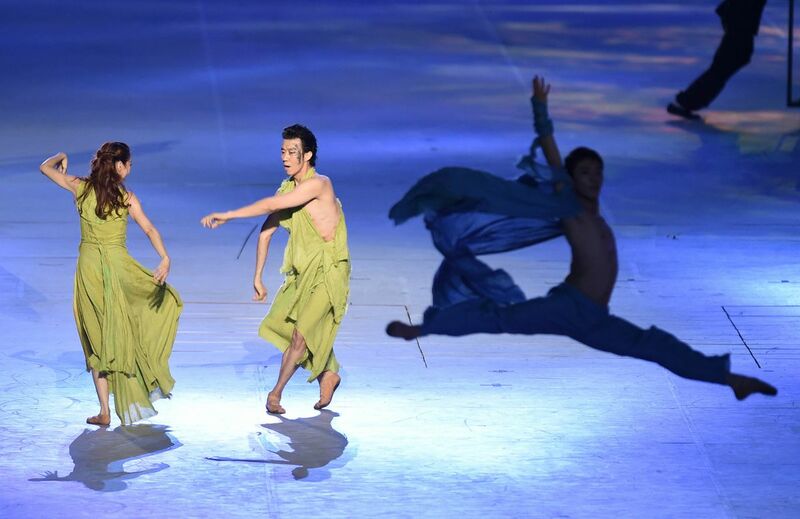 Singapore's Sahil Suhaimi (left) celebrates with team mate Faris Ramli (right) after scoring the first goal for Singapore. 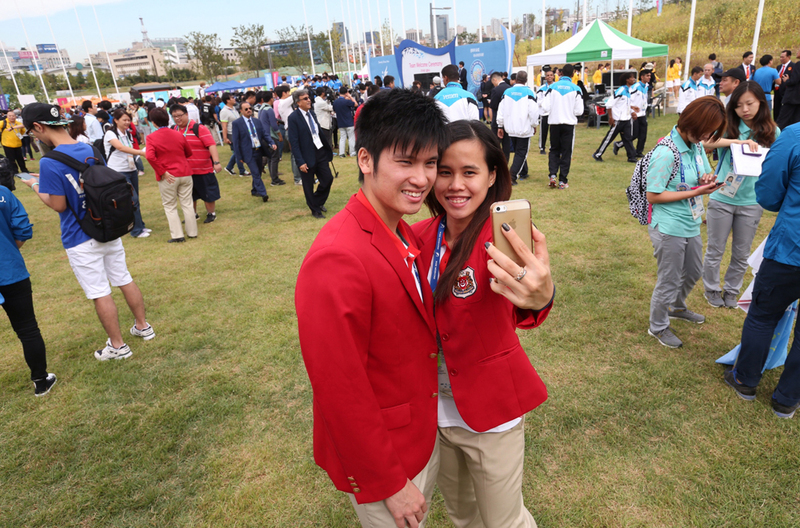 Singapore shuttlers and couple Vanessa Neo (right) and Derek Wong (left) takes a selfie at the Flag Plaza. 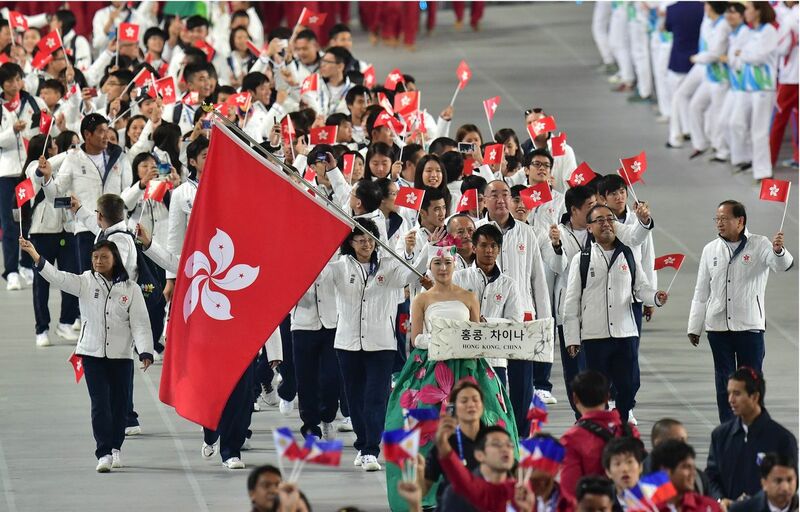 Singapore's national gymnastic team leaving for the Asian Games. 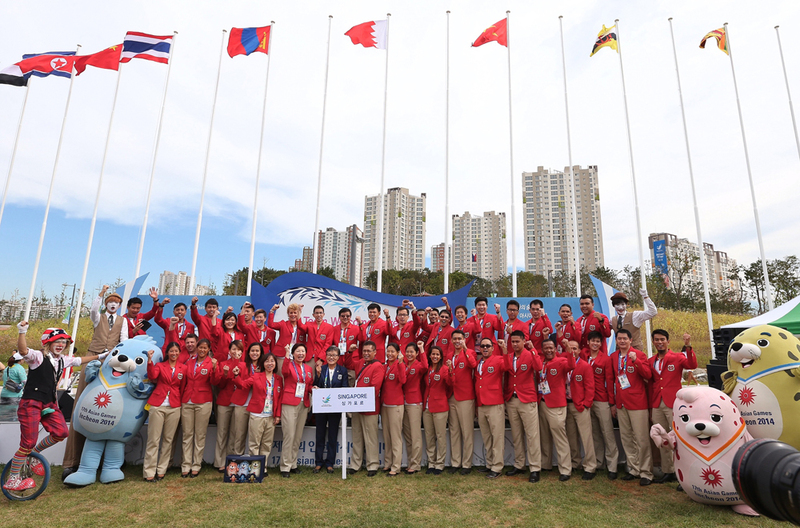 The delegation from Team Singapore cheers during a group photo opportunity. 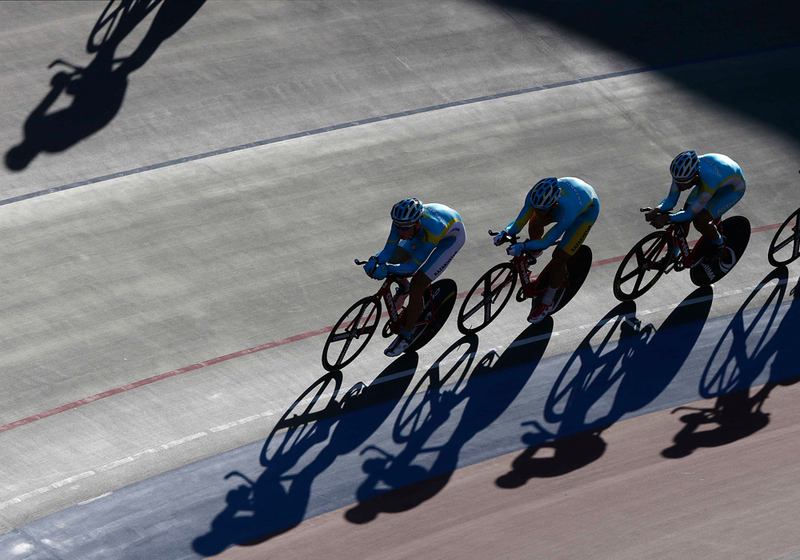 Kazakhstani track cyclists train at the Incheon International Velodrome. 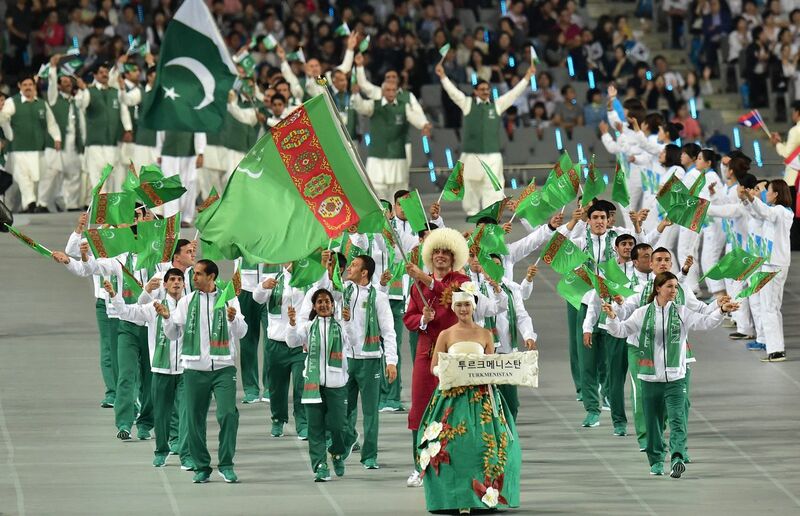 An Asian Games volunteer with the Bangladesh delegation holds up an encouragement placard to show her support. 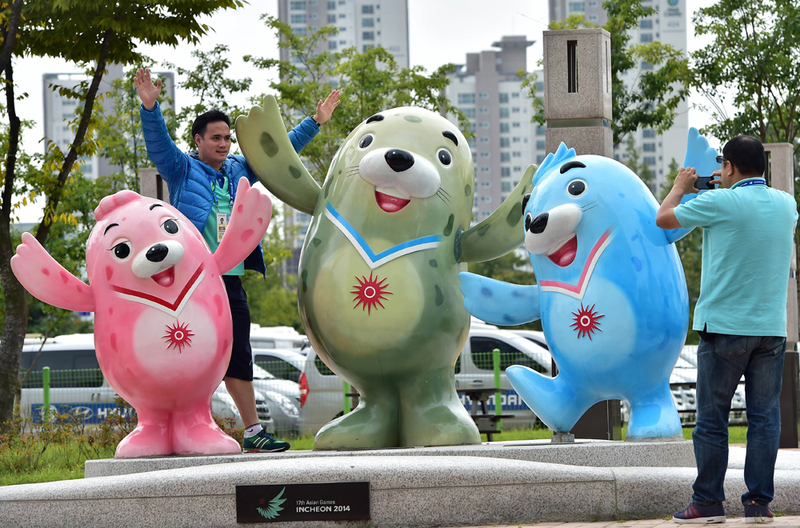 North Korean delegates are welcomed by Barame, one of the three spotted seals and official mascot. 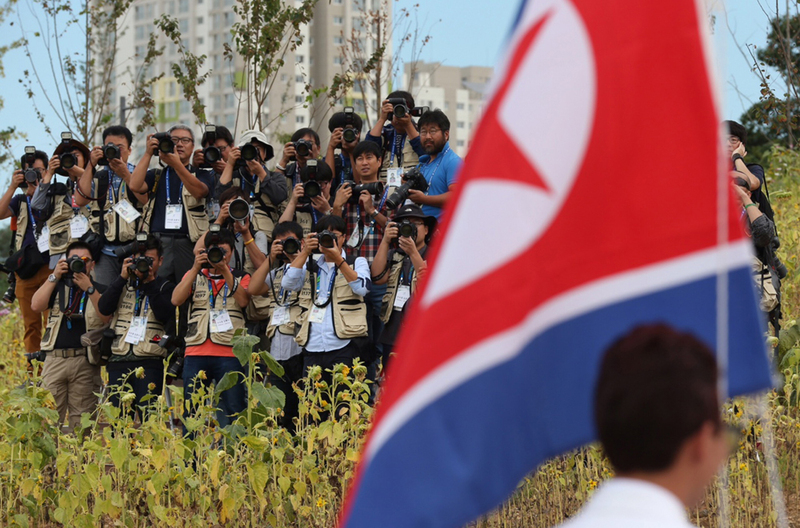 Photographers positioning themselves on a nearby hill for a vantage point to shoot the North Korea flag being raised. 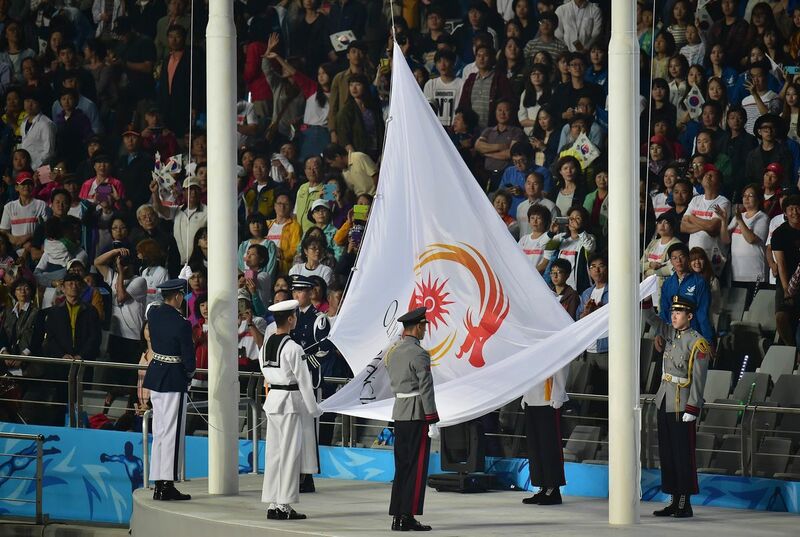 The delegation from North Korea sings their national anthem as their flag is raised. 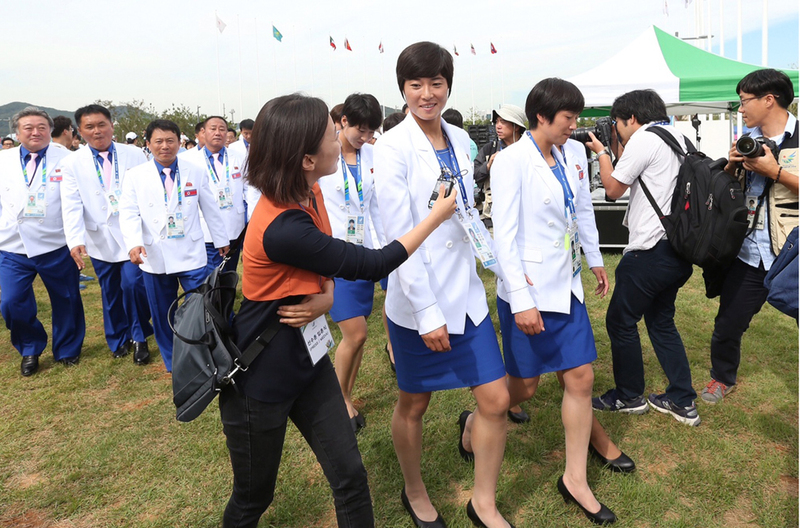 A member of the media tries to interview an athlete from North Korea. 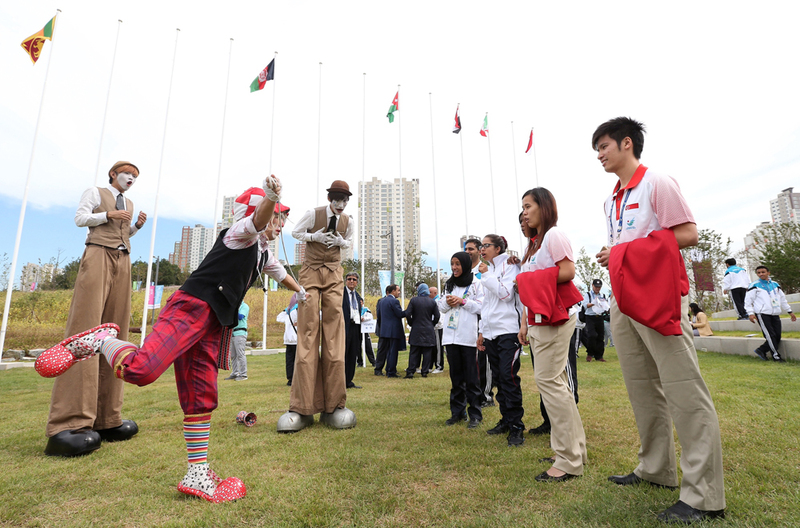 Laila Hossaini from Afghanistan is taking part in the taekwondo event. 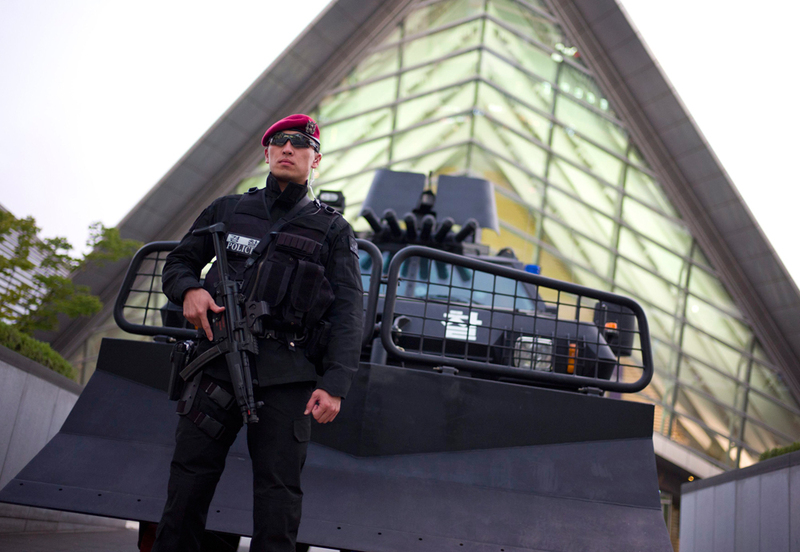 A policeman stands at his post outside the International Broadcast Centre. 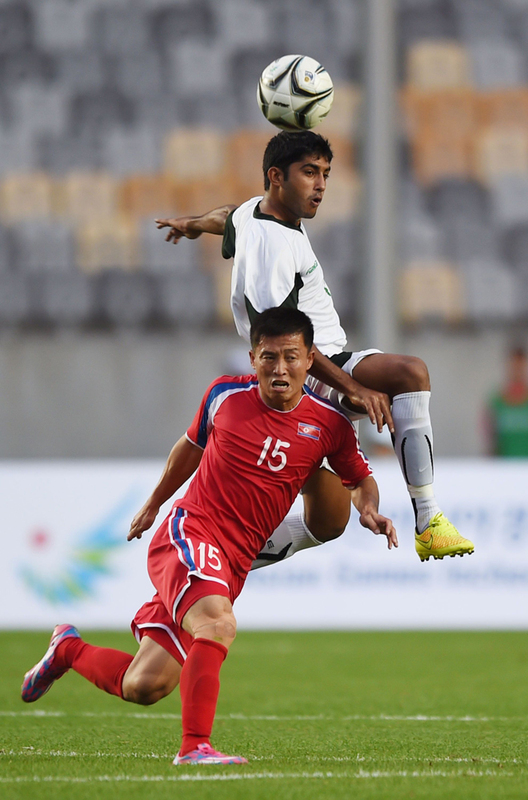 North Korean player Ri Hyokchol (bottom) fight for the ball with Pakistani Muhammad Bilal (top) during the first round of the men's football. 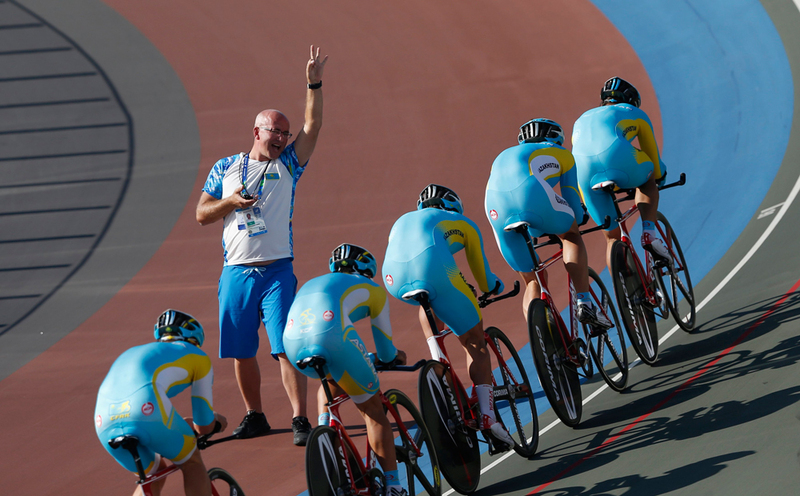 The Khazakstan coach trains his track cyclists. 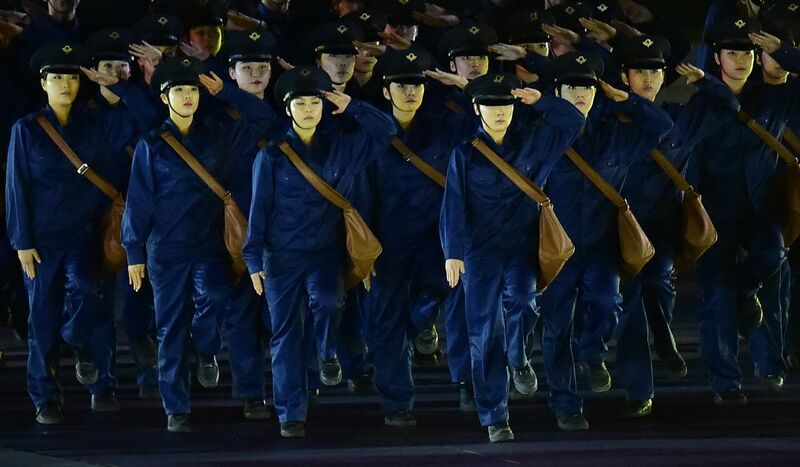 South Korean track cyclists are debriefed by their coach. 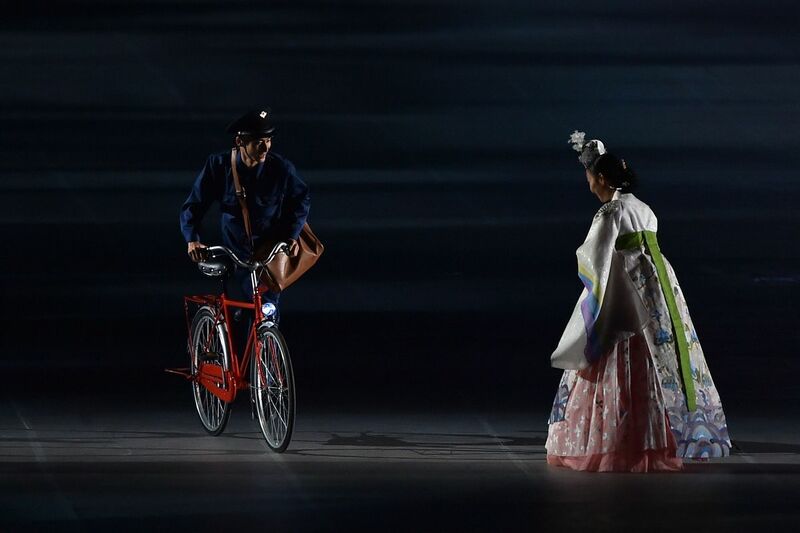 A South Korean track cyclist warms up for practice laps. 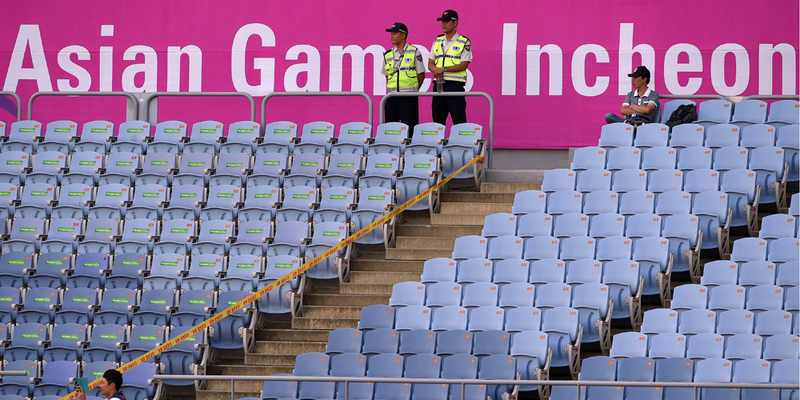 Policemen keep watch as a lone spectator sits in the stand at the Munhak Stadium. 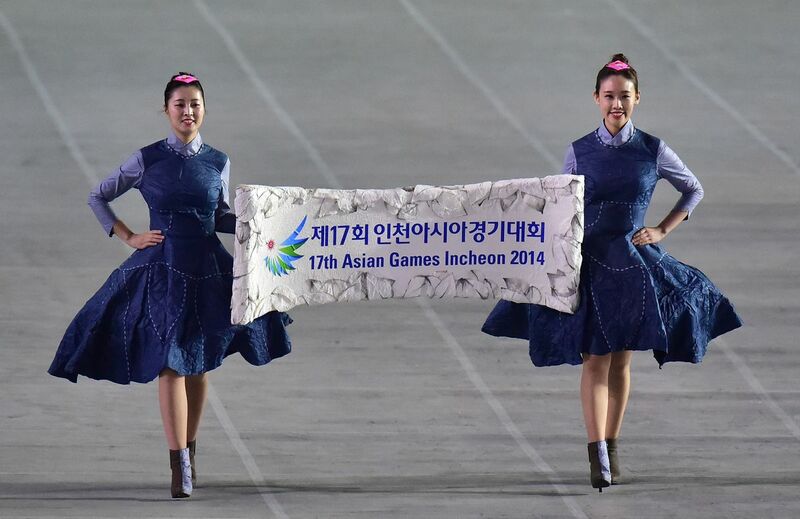 South Korean's display unification placards during the men's first round group F football match between North Korea and Pakistan. 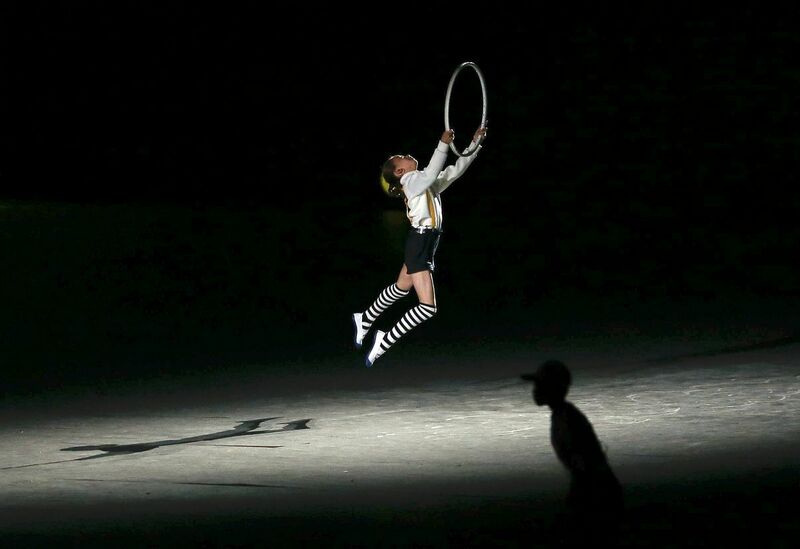 Malaysian badminton player Lee Chong Wei stretches after training at Gyeyang gymnasium. 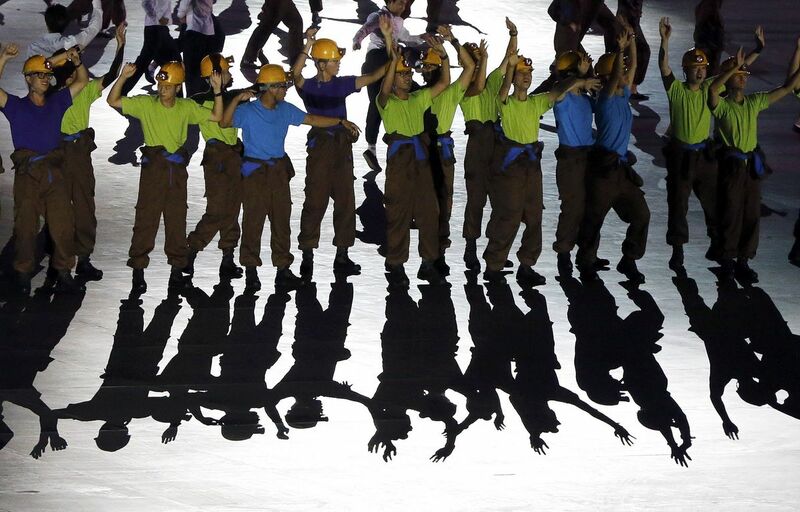 Thailand's badminton players stretch prior to a training session. 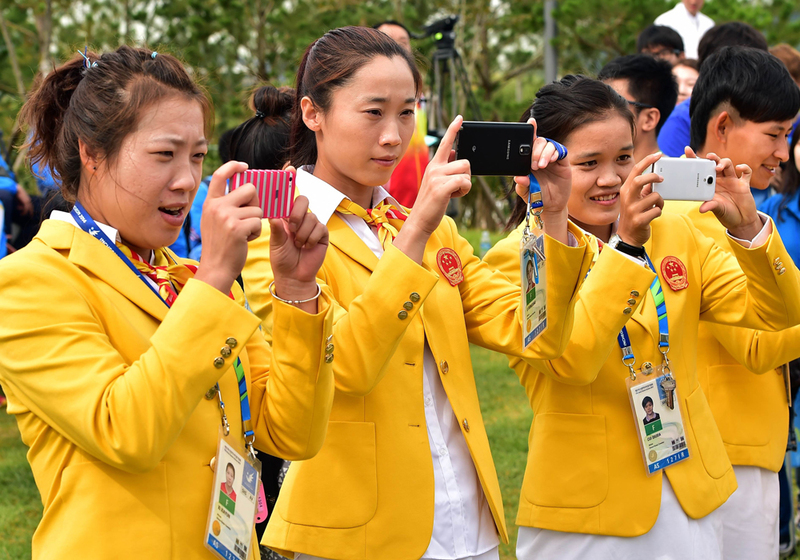 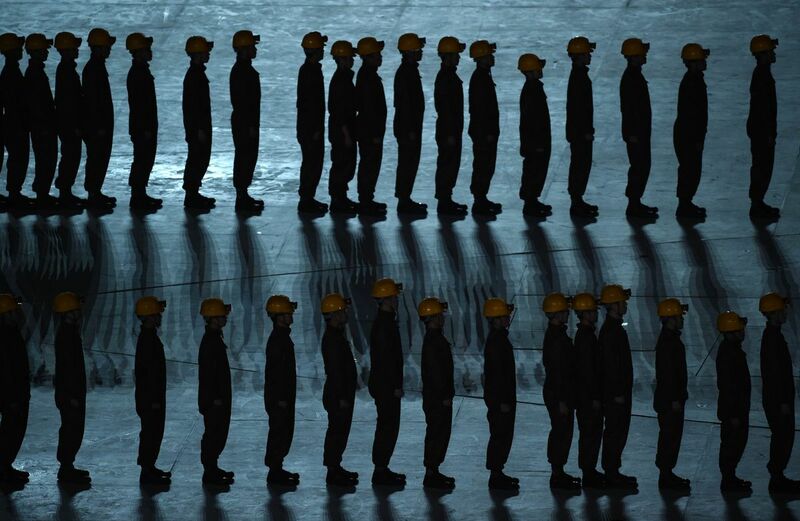 The Chinese team members take pictures during a team welcoming ceremony. 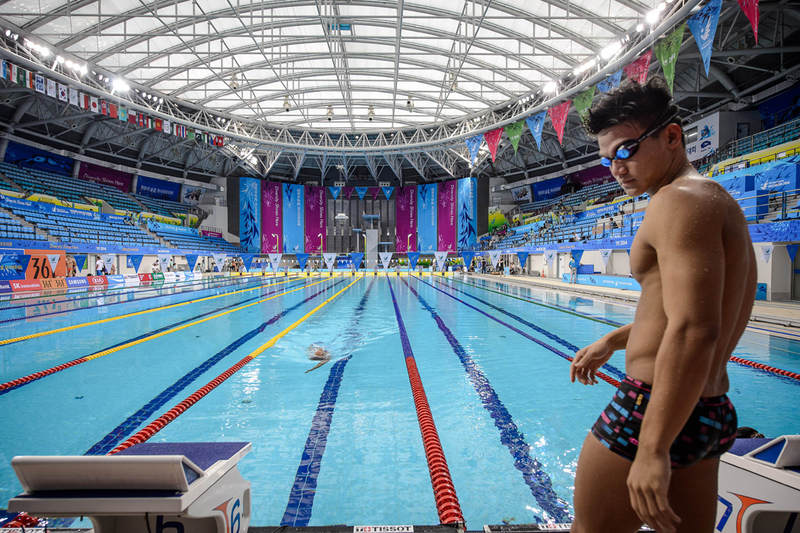 Swimmers train at the Munhak Park Tae-hwan Aquatics Center. 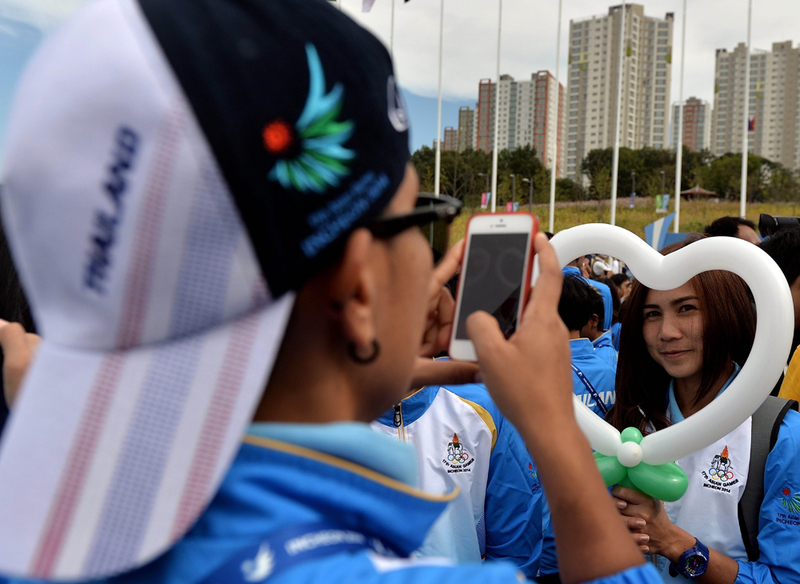 Thai athletes pose for a picture during the welcoming ceremony. 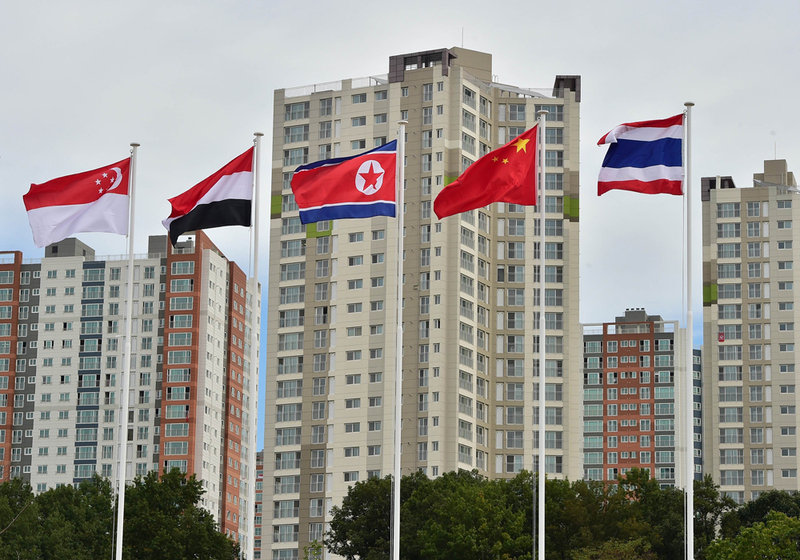 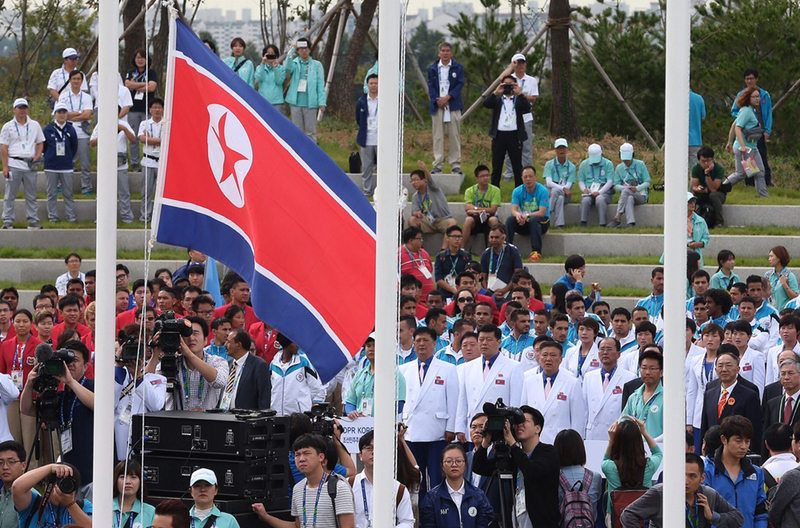 National flags including the North Korean flag (C) are hoisted during a team welcoming ceremony at the athletes village. 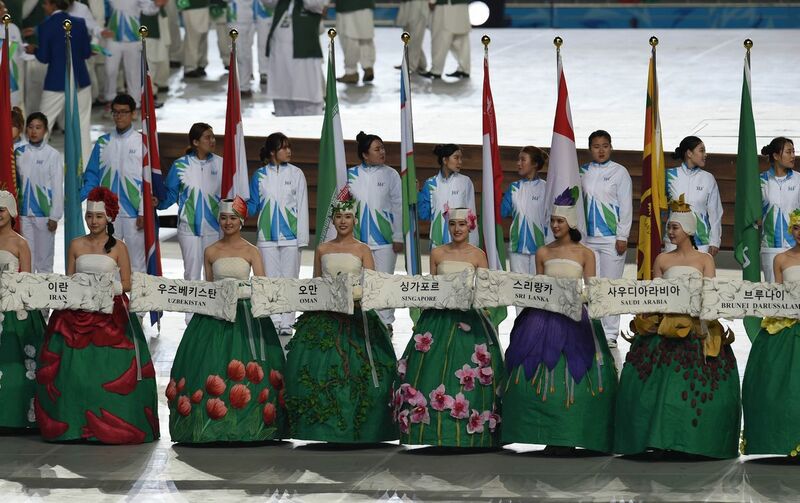 Swimmers dry off after practicing at the Munhak Park Tae-hwan Aquatics Center. 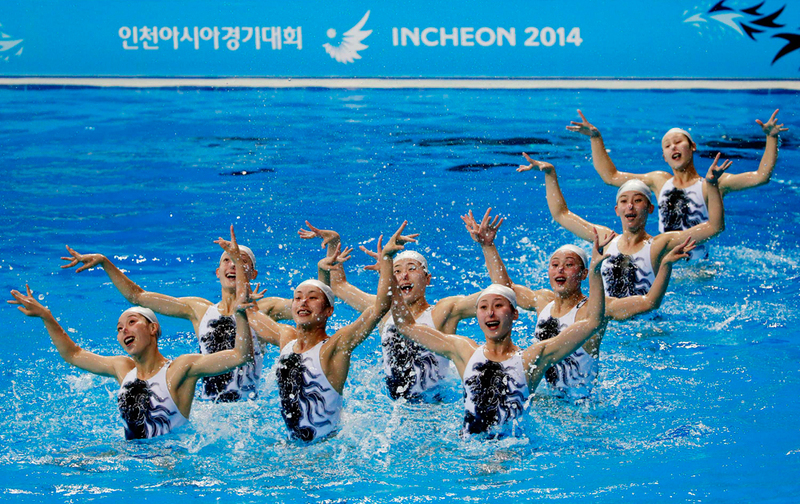 North Korea's synchronised swimming team take part in a practice session. 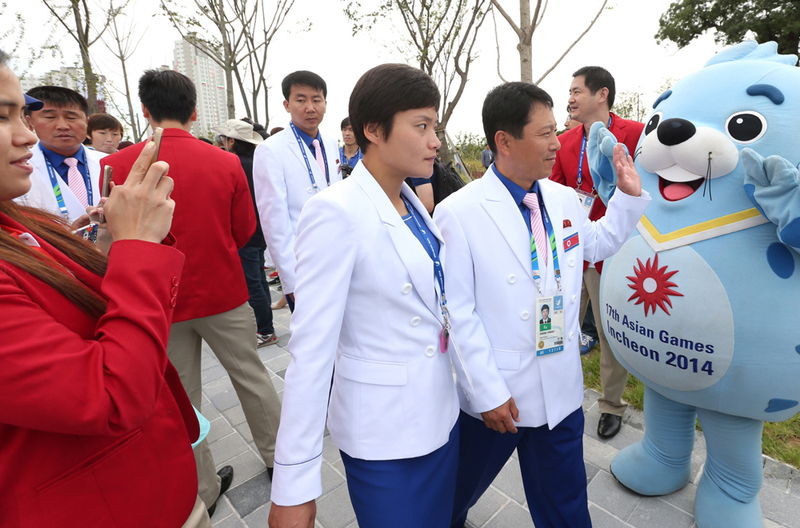 Journalists take pictures with mascots of the 17th Asian Games. 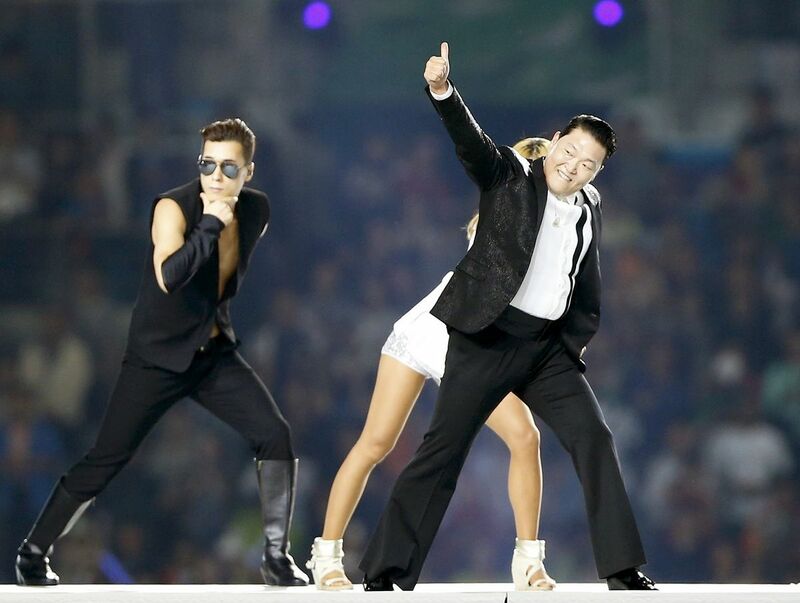 The Asian Games will be opened Gangnam style with a performance by Psy. 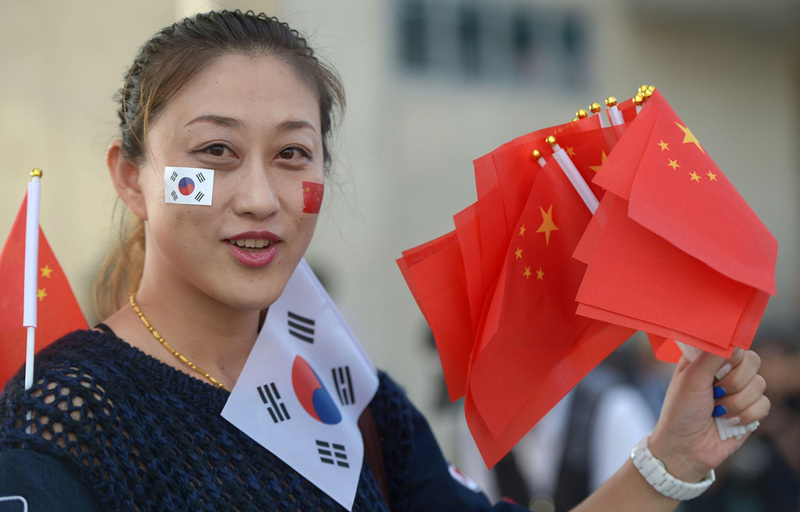 A spectator holds Chinese and South Korean flags at the main entrance prior to the opening ceremony. 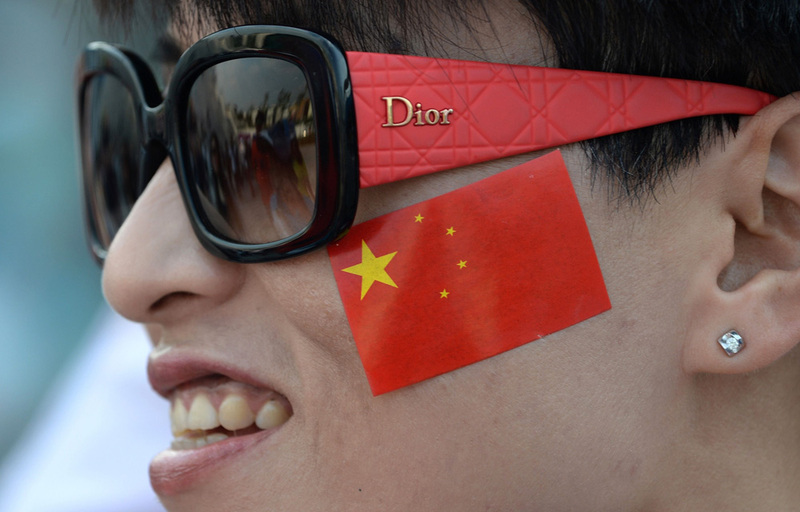 A Chinese spectator poses with a flag sticker on her cheek ahead of the opening ceremony.